Most of the SoV stuff (this thread, and the Books for inducted units) is here because this is where the nominated units come from. Ideally everything would be here, but the display thread needs to be in the joint C3V/SoV subforum for editing reasons (primarily the ability to lock and unlock it when units need to be added). I found that in your typical 1v1, 300ish pt, BoV-type map match-up Tyrian is best used as an end gamer. Under sustained fire he's not going to last very long, so rushing him into the fray immediately was always a bad idea. But as a ranged flyer he was very valuable when I would run him out to pick off those last few annoying squaddies or to soften up a strong target who my opponent was lumbering across the battlefield. In scenario driven play Tyrian was fantastic, never a hesitation to use him right away to deal with an ambush or to scout ahead. Above 400 points Tyrian can get lost in the army. Even though his double attack is valuable, when you're playing 5-800 point armies, there are most definitely going to be better options amongst your ranks. It's even possible that Tyrian may just sit in the start zone for the duration when the points really climb. At 110 points my thoughts immediately went to the Protectors of Ullar. For the same cost I get three ranged flyers, which begs the question: Why take Tyrian? Abilities aside there is one huge difference between Tyrian and the Protectors, his movement of 7. I matched Tyrian up against a squad of Protectors of Ullar several times, and each time it was easy for him to beat the Protectors to height whether he got Initiative or not. They both share a range of 5, but with the Protectors only moving 4 spaces (unless they have Atlaga) Tyrian easily outclasses them in that respect. Usually the Protectors where down one before getting to attack and if they didn't get Combined Arbalest going, they were in trouble. In contrast, when the Protectors were able to lock Tyrian down, he fell quickly with his defense of two and life of four. A pretty balanced match-up in my tests. The model used for this figure is one of the Protectors of Ullar. Much like all the GenCon exclusives it is a sculpt many of us already have, making it very easy to utilize the unit right away. You can repaint if you like and still use him as a Protector when needed, or you can do what I did (I don't like to paint) and just put a blue dot sticker on the base and done. This is also a pretty easy proxy, use a Minion of Utgar, Sentinel of Jandar, or any of several Kyrie Heroes in the game. If you have Wave 9, then you have Tyrian, or like I said, if you have a different Kyrie, then you have an easy proxy. I'm not sure Tyrian will see much play in a tournament environment, but there is definitely a place for him in low point games and in scenario play. I've been involved in conversations recently where some have asked what has happened to the simple Scape unit. One or two straight forward powers and go. Well Tyrian fits the bill perfectly. I found him to be both balanced and very playable in the right situation. There's not a whole lot that is unique about him, but coming from someone who likes to play single general armies, he's a great addition to the Jandar ranks. I vote YES to induct Tyrian the Kyrie Warrior into the SoV. Last edited by nyys; May 31st, 2011 at 03:28 PM. Green Wyrmling by killercactus fills the Charos-sized hole in the wyrmling line-up. 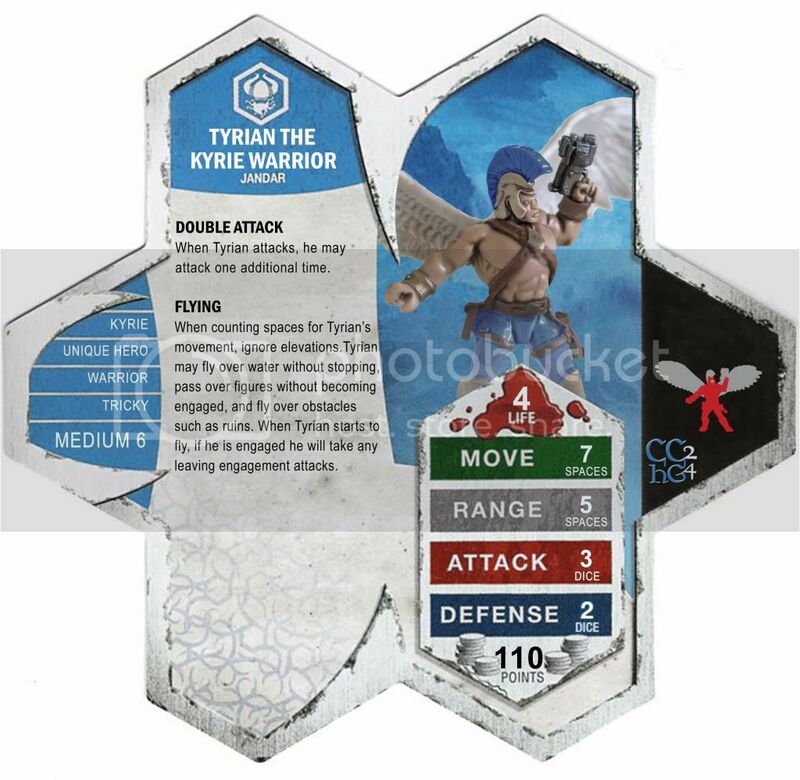 When I first looked over the card I wondered if 4/4 would be a better fledgling-izing of Charos' 5/5 than the 3/5 that they have, but I loved kc's adaptation of Counterstrike and was looking forward to testing this little guy. It did not disappoint. Fledging Counterstrike performs excellently against most melee squads (in my tests they matched up pretty much point-for-point with Knights, Blades and Minions) but they definitely need some support when facing heroes or range. Expensive 3 attack melee squads suffer against them, but that is a small enough niche that I don't think that they're overpowered, even in a draft scenario. I think that 4/4 would probably have been able to inflict as much overall damage as 3/5, but with the higher defense it makes Counterstrike a serious consideration for attacking units, while having a competitive, but not gimmee, attack. I was concerned that Raelin bumping them up to 7 defense would be too much, but generally I'd rather have 3 more wyrmlings. They're basically a 2/3's power, common Izumi squad. They make a fantastic addition to beef up wyrmling armies, or really any army that wants a tough melee screen (4th love their Valiantness ). To top off the mechanics, I had an absolute ball playing them. They have been one of my favorite units to playtest. The numbers of their sculpt is on the low side, but I was able to find enough that I don't feel that it removes them from consideration. I vote YES to induct killercactus' Green Wyrmling into the Soldiers of Valhalla. I really like how the Green Wyrmling perfectly fits in with the others. The 5 defense compliments the Counter-Strike, as well as makes up for the lack of a Ranged special attack. I love playing Wyrmling Armies, and when I saw that kc had created a 'baby Charos' I was very excited to try it out. Fledgling Counterstrike is great, it meshes very will with the other Wyrmling's 'downgraded' versions of their adult counterpart powers. The issue I had going in with this unit was its defense of 5. With that as my greatest concern I paired the GW with RotV Raelin and got astouding results... too astounding. With numbers and proper placement the Green Wyrmlings can completely halt a melee army. Backed by Raelin their Defense jumps to 7, add flying which allows them to take height easily, make it 8, and if a Defense Glyph happens to be around make it 9 defense for a 30pt unit that has Counterstrike. You can reach these kind of gaudy defensive numbers with other Counterstrikers like the Izumi and Tagawa Samurai, but the difference is that neither can fly and they are both also a unique squad of 3. As a Common Hero the Green Wyrmling has no such restriction and when I added 5 or 6 of them to my armies, that is when they really started to take over. As is, I think the GW needs a good points bump (+20?). At 30pts it was easy for me to put 6 of them in a 5-600pt army and also grab 4 squads of 4th Mass and keep their Valiant Defense. One army that was fun, yet powerful was GWx6, Raelin, 4thx4. Send the GWs and Raelin to reek as much havoc as possible, and once Raelin falls the 4th get their defense bonus. This Juggernaut easily outmatched Knight Armies (for me) time after time. Perfect model used for this unit. Relatively easy to get, though a bit on the expensive side, $2.50 - $4.00 before shipping. I really like this unit, but I found it to be too powerful against some of the better builds in the game. I think a drop to 4 defense would move a long way towards make it more balanced, and possibly even a +5 bump in points with the -1D. I vote NO to induct the Green Wyrmling into the SoV. Green Wyrmling by killercactus has received 2 NO to induct votes (Dad_Scaper, nyys) and is removed from the process. I am really disapointed ! The first time I saw the Green Wyrmling, I thought it was too weak. All other Wyrmlings have a ranged special attack, wich seems better that Fledging Counterstrike. But the more I thought, the more I realized its enormous potential and I soon convinced myself it was a great custom. Unfortunately, I did not have time to playtest the Green Wyrmling. Now, I'm not surprised that it is considered too powerful by nyys. I hope killercactus will post a revised version that will be inducted into the Soldiers of Valhalla. PS: I really hope, because I have already bought 4 of them. Counting gray cells and coming up short... Also, I confess to being a fanboy. Aha! *That's* where they all went!! C3V "Easily the best quality classic customs I have ever seen." Hah hah, Sertorius and I bought six of them too, for our own version of the Green Wyrmling inspired by KillerCactus's. Last edited by Typhon2222; June 2nd, 2011 at 05:35 PM. The Green Wyrmling is not so difficult to find. Now 38 are available on AbPrices. I bought mine at http://www.rpglocker.com, which is not listed. Perhaps it's not enough for a Common Hero, but it is much more difficult to find Omegacron (with the good colors). I know kc was at one point considering 6/1/4/4 as a stat array. Let's just say that I wouldn't be annoyed to test the GW again. Oooh, I was soooo hoping KC's Green Wyrmling would make it through, particularly because there is a rumor that a Copper Wyrmling (to match Mimring) is waiting in the rafters to swoop down and completely fill out the mini-Dragon line-up.